Thread: Need Help!! Paroedura Pictus!! I have been keeping pictus geckos for a while now, and I started with just one male and loved him, so I decided to get more. In June I bought 3 CB18 babies, 2 of which were housed in the larger section of an Exo Terra large flat faunarium (with divider), the smaller of the group in the smaller side. They have been doing great all summer, and once their sizes evened out a bit I decided to move them in together into a larger tank. They were all believed to be female, however one of them later developed hemipenes. Before this, one of the geckos suddenly without warning stopped eating, and died in less than 2 days. I seperated her from the others before her death. Very shortly after this, I believe there must have been some aggression between the remaining geckos, as I found them both with missing tails. I seperated them straight away, and they have now been seperated for around 2 weeks. This is where the problems have escalated. One of the geckos is crawling around on her elbows and seemingly can't stand up properly. The other now seems to have a broken front leg, but it may just be a seized up ankle. It's causing him to walk on the side of his foot. Both geckos have very recently started to tremble. I understand that this can be a sign of MBD, however I have been feeding them calcium dusted crickets 3-4 times a week, and the crickets are gut loaded with calcium fruit jelly pots before every feed. I have followed their husbandry by the book. Their heatmats are controlled by a digital thermostat, I mist the sides of the tank at least once a day so they can drink the water droplets. Please help, I don't know what to do. I can't see where I have gone wrong, and I don't know how to make them better! 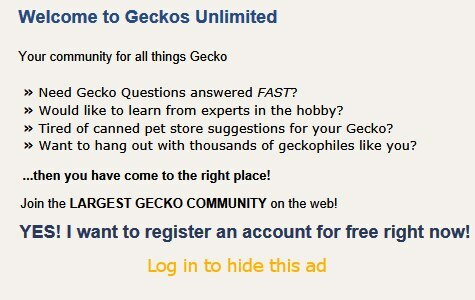 Welcome to Geckos Unlimited. What you've described sounds like MBD to me. Please list the exact names of your powdered supplements and the frequency you've been using them. What you see may be due to that. I've been using Exo Terra calcium + D3 to dust crickets 3 or 4 times a week, and I feed the crickets with Pro Rep (or similar) calcium jelly pots which are constantly available to them. I thought this would be enough for them. Do you think it's possible to reverse it at this point? Is there a better supplement I should be using? Could the dropped tails be a related issue? I've not kept P. pictus. Please share a video(s) of these pictus walking about. How much calcium and how much D3 does your Exo Terra product have? Have you access to Zoo Med's supplements? Calcium carbonate, oyster shell flour, dextrose, Vitamin D3 supplement. Calcium carbonate (35%), ground oyster shells, salt. Here's what I know about Exo Terra multivitamins. It's important for geckos to have some source of preformed vitamin A (retinol) in their diets. Exo Terra multivitamins contain beta carotene instead of preformed vitamin A (retinol). Chances are geckos cannot metabolize beta carotene. So Vitamin A deficiency would result. Exo Terra multivitamins also fall short on vitamins and minerals, such as missing vitamin B12. Last edited by Elizabeth Freer; 10-15-2018 at 01:21 PM.